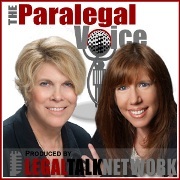 The latest edition of The Paralegal Voice, "Ethics and Professionalism within the Paralegal Profession" co-hosted by Lynne DeVenny and me, is now available at Legal Talk Network. Camille provides ethics tips for paralegals, talks about how paralegals can assist attorneys with client communications, and discusses what paralegals can do to maintain the highest level of professionalism. Vicki and Lynne share practice and social media tips.